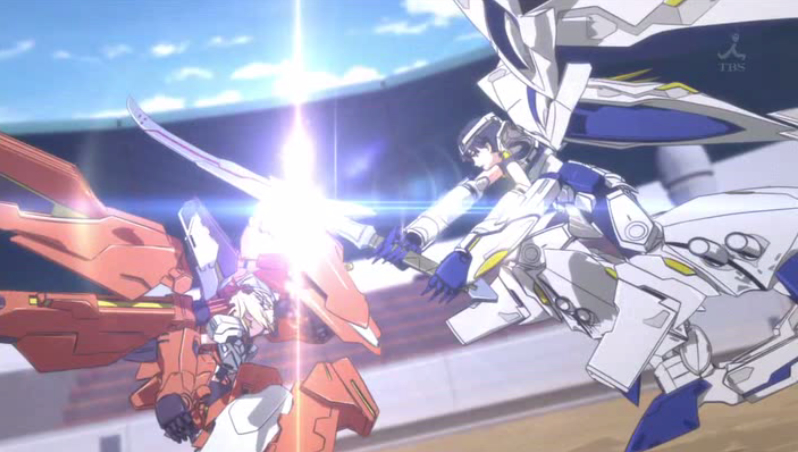 Charles opens the episode by requesting a fight with Ichika during training. Ichika gets absolutely trashed (think losing in less than thirty seconds). Charles explains that perhaps Ichika doesn’t grasp long-range weapons well, and the two practice for a bit with them. 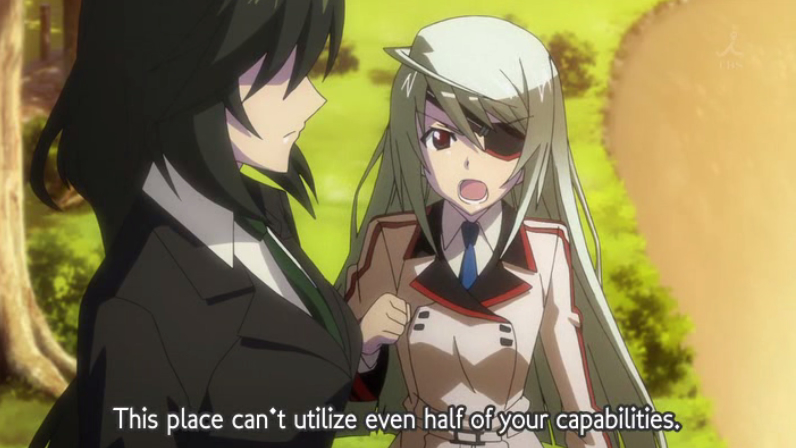 Laura Bodewig interrupts in her third-generation German IS, demanding a fight with Ichika. Ichika refuses (perhaps fearing another thirty-second trashing), and Laura fires a shot at him that gets deflected by Charles. After changing, Ichika witnesses a conversation between Laura and Chifuyu – Laura begs Chifuyu to return to Germany and instruct her, claiming that the students at the academy aren’t worthy of her and hold her back, and that teaching is a waste of her skills. Chifuyu rejects, and Laura storms off. Ichika recalls Chifuyu’s second world championship, where he was kidnapped by unnamed people, and Chifuyu sacrificed her match to save him. Returning to his room, where Charles is showering, Ichika walks into the bathroom to give him some soap… and witnesses that Charles is in fact female. Awkwardness ensues for a bit, until Charles explains his her situation. Her father instructed her to enter the IS academy to pose as a sort of IS spy, and she poses as a male to be able to get closer to Ichika and his IS for data. Ichika offers to keep her gender a secret so that Charles won’t be removed from the school. 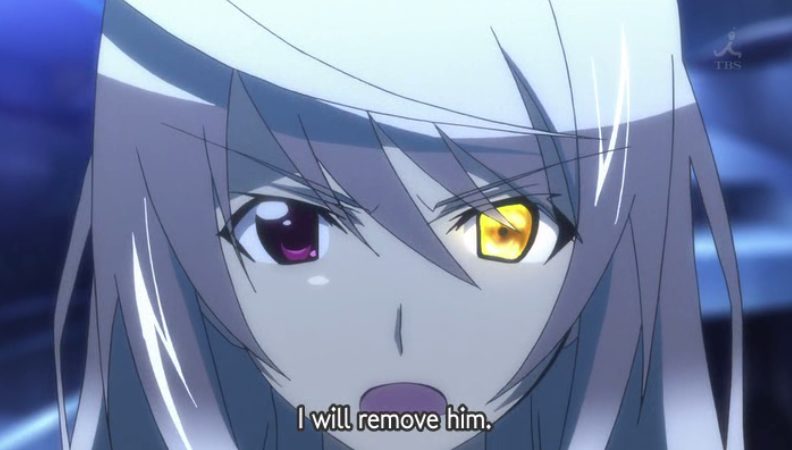 The episode ends with Laura alone at night, with her eyepatch removed revealing a sharingan shining, golden, left eye. She says to herself that Ichika is the reason why Chifuyu has been ‘blemished’, and announces that she will ‘remove’ him. This episode develops two characters at once, and does so quite well, with Laura’s scenes being more active and serious and Charles’ being more romantic and lighthearted. 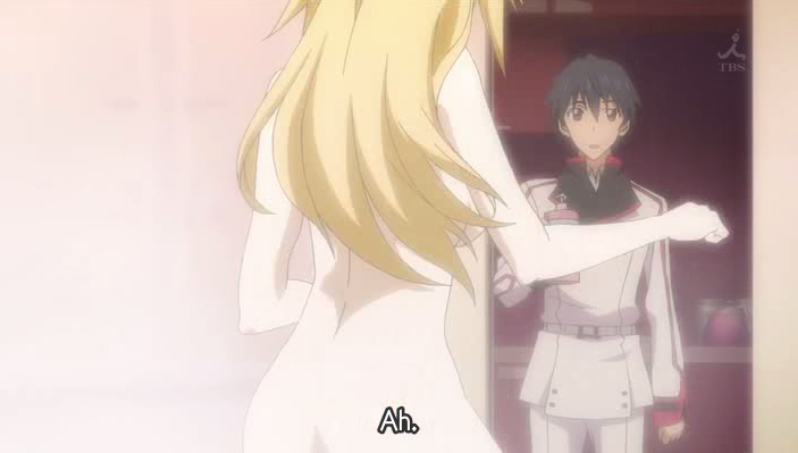 I laughed at the stunning awkwardness of Ichika’s zomgwtfboobs!? moment when he walked in on Charles. ﻿There’s some backstory on our male character too, albeit short. His kidnapping, which forced Chifuyu to forfeit her world title, explains the preoccupation he has with being a good brother to her and protecting them. Amazingly, neither Laura nor Charles are yet in love with Ichika (the last girl who wasn’t in love with Ichika was Cecilia, and that didn’t even last an episode). Charles’ relationship with Ichika seems platonic, and Laura’s is like hate – it will be quite interesting to see how these relationships develop. Charles seems to be slipping into the harem, from the second half of the episode, but Laura looks as if she’s acting as the antagonist of the series. I’m grateful to Laura for spicing this anime up a bunch :3 Can’t wait to see what her eye thing does. Laura looks awesome, especially in her IS suit. Definitely. Her IS looks a bit evil but that’s okay! Evil-looking people are always the good-looking too. big cannon is big. 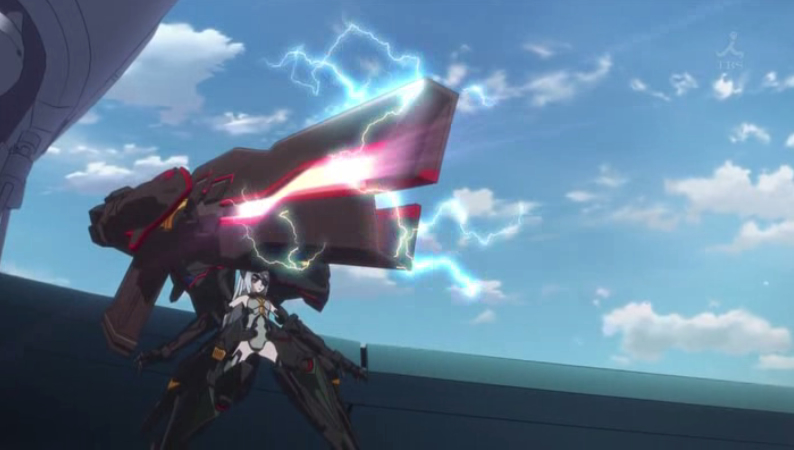 Reminds me of Gundam 00’s Tierra’s mech. I think Laura will soften her heart in the later episode of this series and enter Ichika’s Harem as well (I hope…). Well, look how Ichika mad other girls fall in love with him. It works like a charm. Look at Charles, already developed her feeling towards him. Hmm… Yeah, thats probably true… Somehow, it seems almost impossible to see her soft side.